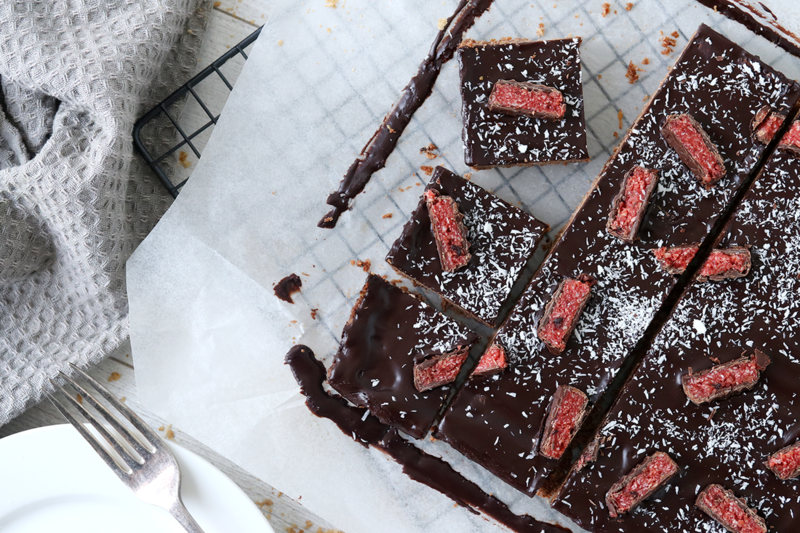 Cherry & Coconut Slice + 4 Wheat Biscuit Recipe Ideas! Wheat biscuits have been a staple food of mine since I was a child, and it’s a food that I would say most of NZ is familiar with! My first memories are made of two biscuits nestled in a bowl, a *not so* light sprinkling of brown sugar and warm milk poured perfectly over the top; unlike most of my food preferences, this one that hasn’t changed as the years go on. One thing I always end up with when I buy wheat biscuits is way more than I can manage to get through, so this week Countdown challenged me to use them in 5 ways that I wouldn’t usually. At first, I thought this may be difficult, but it really wasn’t! They have an amazing texture which gives so well to dishes you want to give a bit of crunch, but they also add substance to dishes you’d like to make a bit more filling. My main recipe (pictured above) is a delicious Cherry & Coconut Slice! See below for the recipe. When I was in Countdown I saw that they are now on Price Lockdown for only $4! So not only are the cheap, but they are have a 5 star health rating and are packed full of fibre. You’re probably thinking by now Rhi hurry up and tell us what you made! So let’s go. 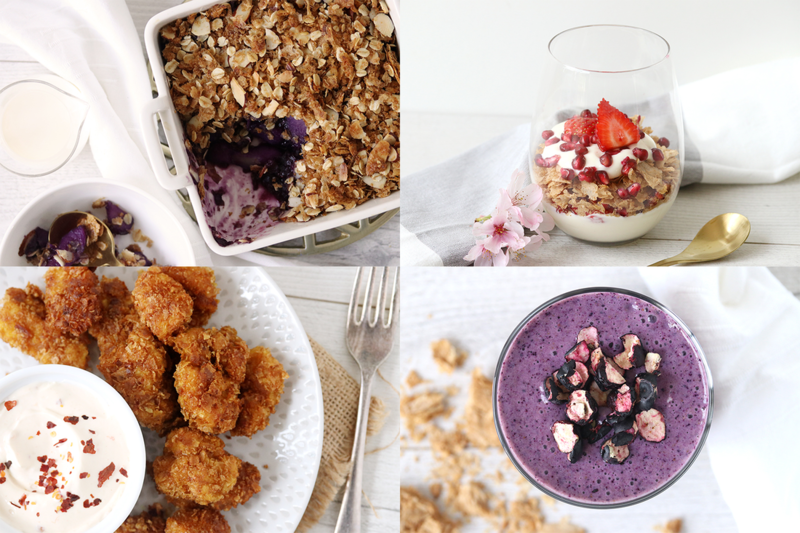 Oaty Crumble Topping - this crumble topping isn’t biscuity like your standard, but the textures are amazing! 2 crumbled wheat biscuits mixed with ¼ cup flaked almonds, ½ cup of oats, 1tbsp brown sugar and 75g of melted butter. Sprinkle over your favourite fruit filling and bake! Strawberry Pomegranate Parfait - perfect for breakfast or brunch, layers of creamy vanilla yoghurt, fresh strawberry, the crunch of wheat biscuit and little pomegranate seeds. Popcorn Chicken - the only savoury recipe, but I think one of my favourites! Replace bread crumbs for crushed wheat biscuits when crumbing your chicken, shallow fry and serve with spicy sour cream. SO crunchy and delicious! For extra flavour I mixed some New Orleans inspired spice mix to the crushed biscuits. In a bowl, combine all of the dry ingredients and stir well to combine. Stir in the melted butter until the mixture comes together. Press into a line square baking tin, and bake for 15-20 minutes or until the edges turn slightly golden. Leave to cool. To finish, spread the top with chocolate icing, then sprinkle with coconut and cherry ripe pieces. *For the icing, mix 1 cup icing sugar, 1 ½ tbsp cocoa powder and 2-3 tbsp water until smooth, thin enough to spread but not too runny.